At Idaho Power, biologists study fish and their habitats to learn how water levels from the Snake River flowing from our dams affect these habitats. They also study the water quality and snails. Fish also depend on habitat created by springs that flow into the Snake River, including a small fish called the Shoshone sculpin. This fish is found only in springs in the Hagerman, Idaho area. Our biologists help monitor the health of this unique fish. Other fish we monitor include Chinook salmon, rainbow trout, bull trout, white sturgeon and warm water fish. The Malad River is a tributary to the middle Snake River located near Hagerman, Idaho. The Malad River, with its cold, clear spring water, is excellent habitat for rainbow trout. This river joins with the Snake River near Hagerman, Idaho. Because we have two hydropower dams in the lower part of the Malad River, we built fish passage facilities to help rainbow trout pass the dams both upstream and downstream. Video imagining is also used to record fish movement and size. Since we built these passages starting in 2008, more than 2,500 rainbow trout use them each year to travel upstream and downstream. Bull trout are federally protected and important to Idaho and Oregon. In the Snake River, bull trout are found in Oxbow and Hells Canyon reservoirs and downstream of Hells Canyon Dam. We are working with state and federal agencies to create a program to monitor the health of bull trout. This program includes plans to improve habitat and create a passage for bull trout. This passage will allow fish to move through the Hells Canyon Complex (HCC) and connect bull trout from other rivers that flow into the Snake River. Without this passage to connect them, small populations of bull trout are more vulnerable. The bull trout passage program is being developed in consultation with the U.S. Fish and Wildlife Service, the Idaho Department of Fish and Game and the Oregon Department of Fish and Wildlife. Our biologists also monitor how river flows affect bull trout that spend the winter in the Snake River below Hells Canyon Dam. White sturgeon are an ancient fish that live near the river bottom. They are the largest freshwater fish in North America and can weigh as much as 1,500 pounds and measure more than 12 feet long. Over the past century, white sturgeon have been fished too much and their habitat has been reduced. Dams have blocked access to where they lay eggs and trapped them in small populations between dams. In Idaho, the two largest reproducing populations of white sturgeon are below Bliss and Hells Canyon dams. Only small numbers of fish exist in the other reaches. To protect white sturgeon, we created a program to monitor their health in the Snake River from Shoshone Falls downstream to the Hells Canyon reach. We also survey sturgeon and track their health. Read our most recent report. The Fish Passage Center is paid for by Bonneville Power Administration (BPA). It provides information on anadromous fish (fish that travel to and from the ocean) that go through the main Snake and Columbia rivers hydropower systems. Anglers can find out how many adult anadromous fish enter the Snake River Basin each year and how those numbers compare to past years. 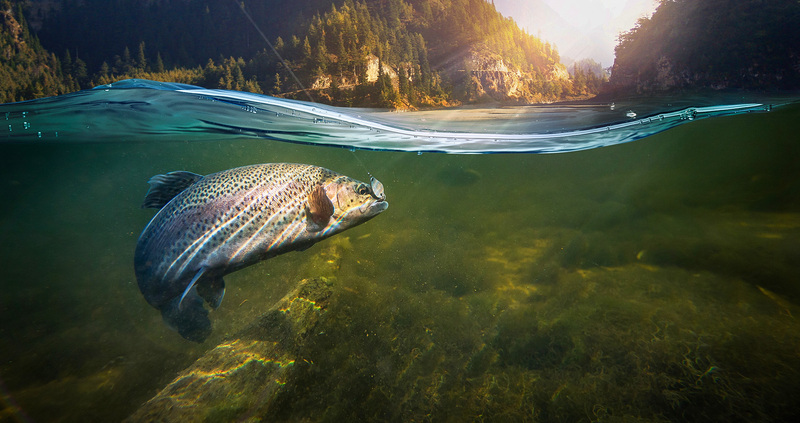 The Idaho Department of Fish and Game (IDFG) and Oregon Department of Fish and Wildlife(ODFW) also provide information on fishing seasons and license and tag requirements for salmon and steelhead in Idaho and Oregon waters.